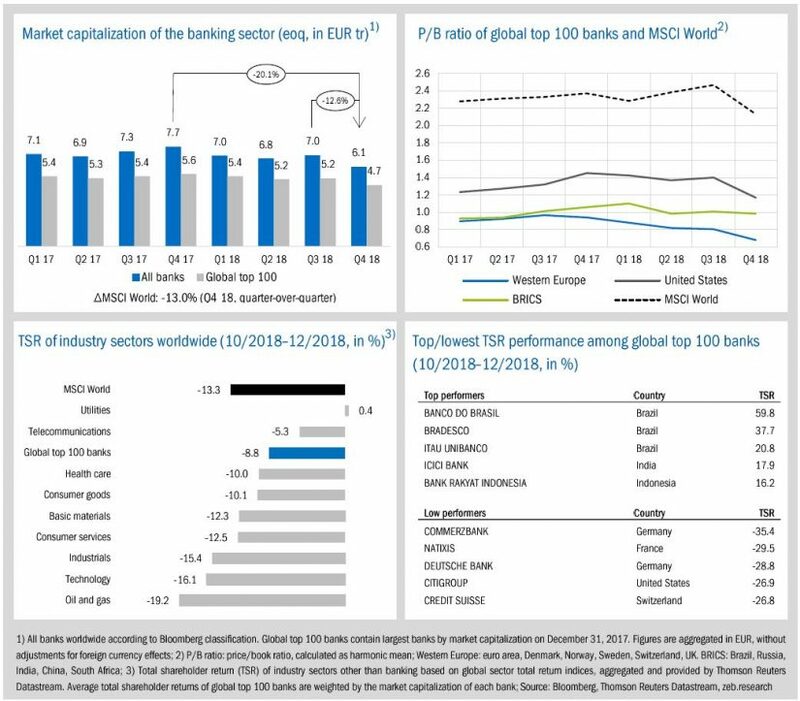 In line with overall declining stock markets, global top 100 banks showed a decreasing market cap of -9.9% in Q4 2018 (-15.5% yoy) and a negative TSR of -8.8% qoq (-9.5% yoy)—European banks showed even larger TSR losses (-14.4% qoq, -22.7% yoy). Massive corrections to average P/B ratios—European banks ended the year with a P/B ratio of just 0.68x. The economic climate in Western Europe deteriorated sharply while GDP growth is expected to slow down further in Q4 (1.5%, -0.2pp). On the contrary, in the U.S., economic sentiment brightened (+8.2 balance points to +27.8). The Fed increased interest rates for the fourth time in 2018 but lowered its projections for hikes in 2019. Compared to previous years’ figures, profitability of global top 100 banks increased by +0.5pp to 12.0% in the third quarter of 2018. U.S. banks were able to increase their average post-tax RoE by +2.6pp yoy reaching a new peak value of 13.0%. 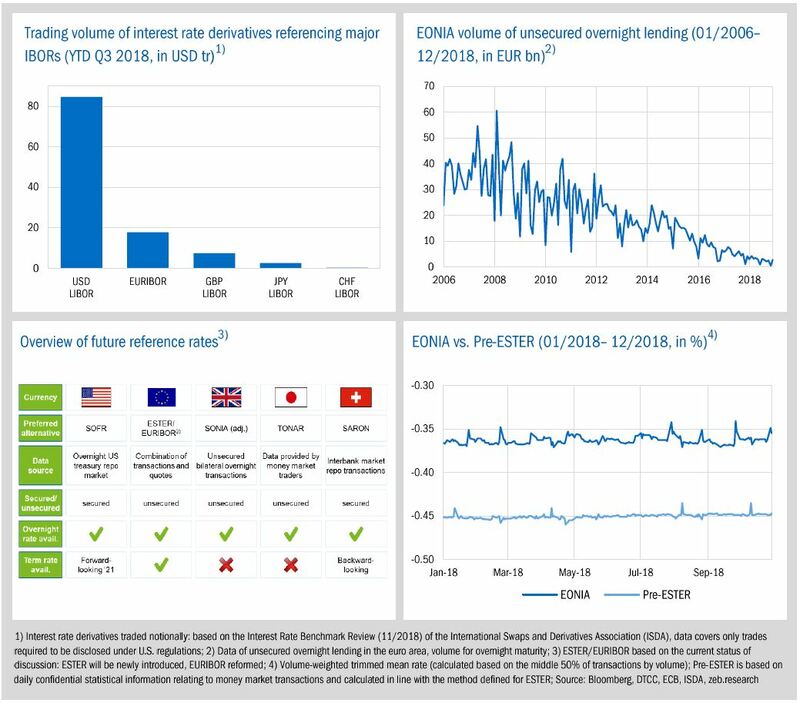 By the end of 2019, EURIBOR and EONIA will have to be reformed while LIBOR benchmark rates should be replaced by the end of 2021. The global banking industry finished 2018 with disappointing capital market performance. In line with overall declining global stock markets, global top 100 banks showed a decreasing market capitalization of -9.9% qoq (-15.5% yoy) and a negative total shareholder return of -8.8% qoq (-9.5% yoy). Regarding the P/B ratio, European banks ended the year with just 0.68x—the lowest value since Q2 2016 (-0.13x qoq, -0.26x yoy). The negative trend of the banking sector’s market capitalization continued. In Q4, market cap of the entire banking industry decreased by -12.6% qoq (-20.1% yoy) to EUR 6.1 tr, the lowest value in two years. Average P/B ratios showed, in part, massive corrections. MSCI Worlds’ P/B ratio decreased by -0.34x qoq to 2.13x and the P/B ratios of U.S. banks by -0.23x to 1.17x, however, both being still significantly better than European banks. Throughout the year, BRICS banks were able to keep shareholder value nearly constant in 2018 (-0.7% qoq, -0.2% yoy). 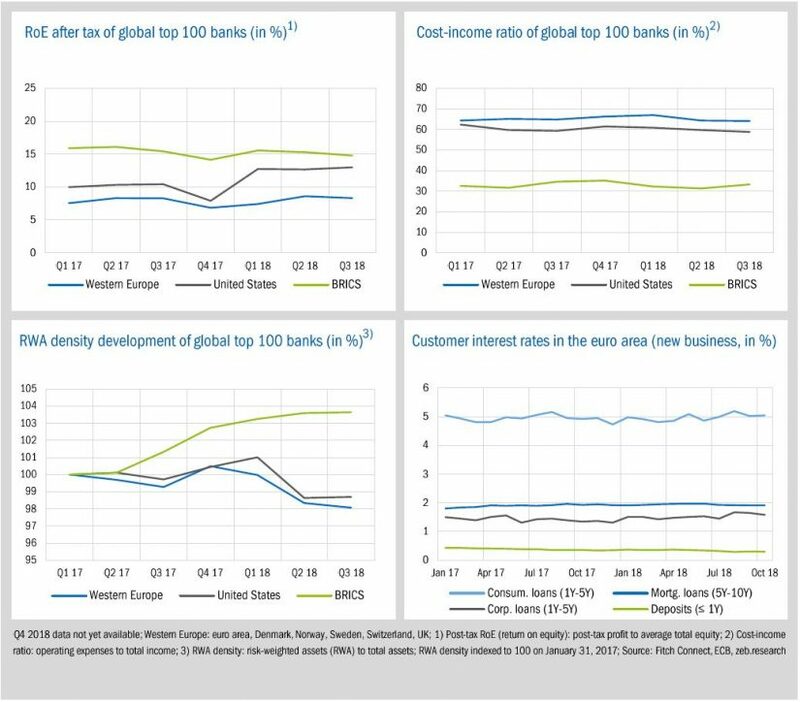 In contrast, Western European banks as well as U.S. banks were the low performers among global top 100 banks and had to absorb large TSR losses (U.S. banks: -15.9% qoq, -17.4% yoy; European banks: -14.4% qoq, -22.7% yoy)—further catalyzed by monetary policy decisions and continuing political uncertainties (e.g., Brexit and trade war). BRICS banks again dominated the top performing banks. The top three Brazilian banks benefitted from positive market developments after the results of the presidential election at the end of October. According to the ifo index, the economic climate in Western Europe deteriorated sharply (-13.0 balance points to -1.0) as GDP growth is expected to slow down even further in Q4 2018 (1.5%, -0.2pp). On the contrary, economic sentiment in the U.S. improved (+8.2 balance points to +27.8) and economic growth is expected to continue on its path. Effects of the U.S. budget debate and the consequential government shutdown at the end of Q4 2018 are expected to negatively influence Q1 2019. After reaching the peak value in Q1, global economic sentiment becomes lower from quarter to quarter. The indicator dropped by -5.1 balance points in Q4 and after two years retuned to a negative value of -2.2. Germany’s expected GDP growth decreased for the fourth time in a row to just 1.1%—the lowest value since Q1 2015. Despite political pressure to keep U.S. rates unchanged, the Fed increased the interest rates for the fourth time in 2018 but lowered its projections for hikes in 2019 to two, down from three before. This decision negatively affected U.S. and European stock markets and the USD Libor curve is now partially inverted for rates between 3 to 8 years. 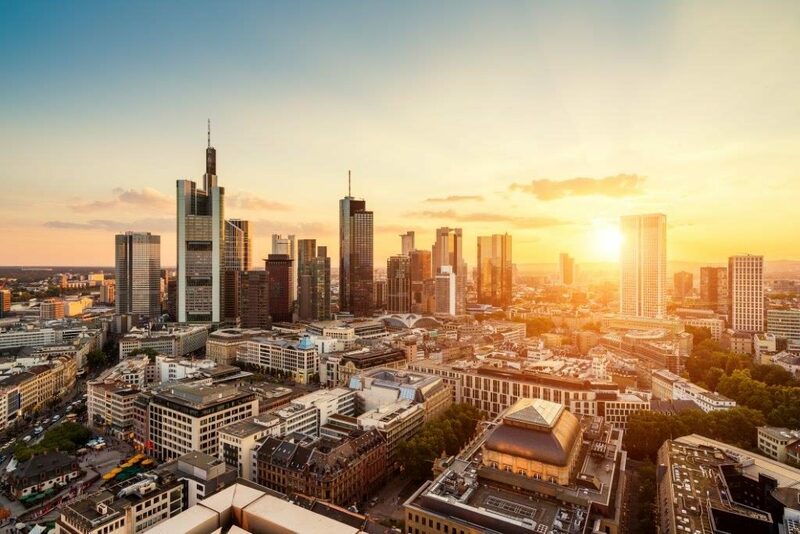 In December 2018, the ECB ended its net asset purchase program and confirmed intentions to keep rates unchanged through the summer of 2019. However, a deteriorating economic outlook has led to market expectations that rates will be held for a longer period leading to a downward shift at the long end of the EURIBOR curve. Compared to previous’ year figures, profitability of global top 100 banks increased by +0.5pp to 12.0% in the third quarter of 2018. 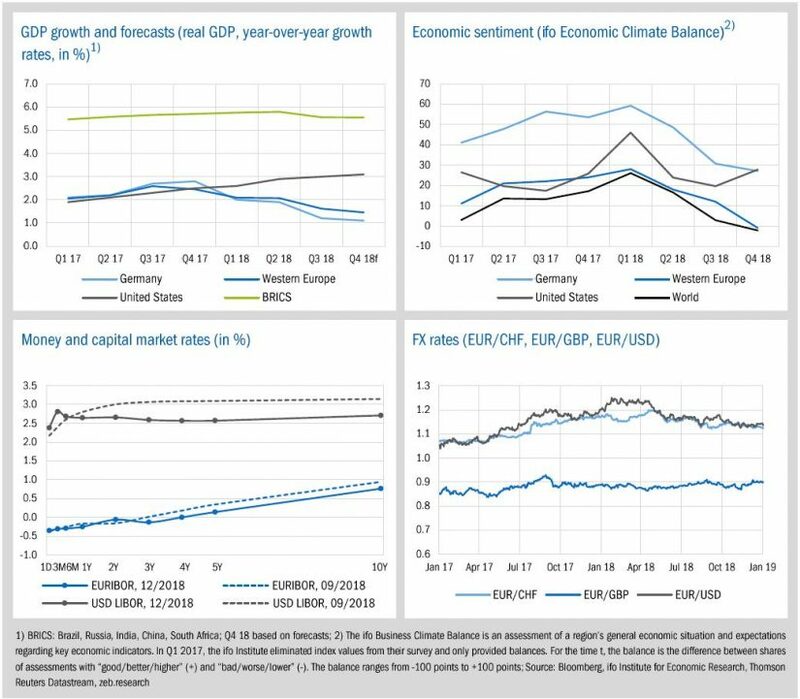 Post-tax RoE of European banks matched the previous years’ value of 8.3% while BRICS banks’ RoE dropped by -0.6pp yoy below the Q3 2017 value (14.8% in Q3 2018). U.S. banks were able to increase their average post-tax RoE by +2.6pp yoy reaching a new peak value of 13.0%. Among European banks, especially the Swedish banks were not able to repeat their strong last quarter results (RoE Q2 18: +2.7pp qoq) and therefore had to forfeit some of their strong profitability increase (RoE Q3 18: -1.2pp qoq, +1.6pp yoy). The profitability gap between U.S. and European banks widened slightly in Q3. In the U.S., due to a still positive economic environment, almost all banks were able to increase net income positions. This is also reflected in further decreases to CIR at U.S. banks (-0.6pp qoq) which was additionally driven by cost reductions of some large U.S. peers in Q3. Corporate and consumer loan rates in the euro area further increased over Q3 2018. Compared to the beginning of the year, consumer loans rose by +0.31pp and corporate loans by +0.27pp. Deposit rates continued their overall negative long-term trend with a reduction of -0.05pp over the first three quarters of 2018. By the end of 2021 at the latest, all established interbank offered rates (IBORs)—like LIBOR, EURIBOR and EONIA—have to be amended or replaced. Besides the challenge of selecting appropriate alternative reference rates, the transition will lead to complex and expensive tasks for banks and other capital market participants. While the full set of alternative rates has not yet been found, the transition plan is defined and it is already time to act. LIBORs, EURIBOR and EONIA are the most important reference rates in capital markets and represent the average interest at which banks can borrow unsecured funding from one another in all major currencies and for a variety of maturities up to one year. Furthermore, these rates are used in many products like retail, corporate and syndicated loans, time deposits, bonds as well as a wide range of interest rate derivatives. The corresponding market for such products is huge. For instance, in the first three quarters of 2018, traded derivatives referencing the EURIBOR and the LIBOR in major currencies totaled around USD 113 tr—thereof 75% in USD Libor and merely 15% in the EURIBOR. Based on figures from the Bank of England, LIBOR approximately underpins in total USD 300 tr of financial contracts. In the past, however, concerns regarding the reliability and robustness of these benchmark rates were raised in the market. First of all, as LIBORs, EURIBOR and EONIA are based on estimates submitted by a specific representative panel of banks, they were subject to several massive manipulation attempts. Furthermore, following the financial crisis, banks funding behavior changed towards secured transactions and market activity for unsecured interbank borrowing decreased significantly. The market for unsecured overnight lending in the euro area for example—which the EONIA is based on—shows gradually disappearing liquidity as the trading volume has continuously declined in recent years. Consequently, the sustainability of EONIA as a benchmark rate has been viewed critically. As a result, in 2013, the Financial Stability Board (FSB) was commissioned by the G20 nations to review major interest rate benchmarks. Based on FSB’s recommendations, public/private sector working groups for each currency were formed to reform interest rate benchmarks and to develop alternative nearly risk-free benchmark rates (RFRs). The reformation is based around the guideline that stipulates that new RFRs be based on liquid market transactions to make them sufficiently robust. Since then, progress has been made regarding overnight rates and alternative benchmarks were presented for all major currencies: SONIA (GBP), SOFR (USD), TONA (JPY), and SARON (CHF). In September 2018, the European working group selected ESTER to replace EONIA. This rate is based on wholesale unsecured overnight borrowings of euro area banks and is expected to be ready to use by October 2019. To make the transition easier and to reduce market uncertainty, the ECB publishes pre-ESTER rates as preliminary figures. At the same time, discussions are ongoing about reformation of EURIBOR using a hybrid calculation method based on transactions whenever available. Whereas established LIBORs are based on unsecured transactions, new rates differ regarding the degree of securitization. Furthermore, only overnight rates are currently specified across all currency areas and term rates have to be derived from the alternative overnight rates which—along with EURIBOR—is still a work in progress. Therefore, no complete solution has yet been found and a “one-to-one” transition is probably not possible. The transition process is even more complicated due to tight scheduling. UK regulators are stressing that LIBOR benchmarks should be replaced by the end of 2021 and, to comply with the new EU benchmark regulatory requirements, EURIBOR and EONIA have to be reformed already by the end of 2019. However, as ESTER will not be published until October 2019, there is only little time to react for the banking industry to transfer EONIA positions to ESTER. Therefore, to ensure an orderly transition, the ECB working group has already requested an extension to the replacement date in the form of a two year phase-in period. Especially for banks, the new set of benchmark rates has overarching implications and will lead to extensive change requirements regarding products, processes and banking systems across all business segments. A multitude of IT systems in various banking areas must be changed to process the new benchmark rates consistently. The large number of affected front and back-office systems—incl. market data, trading or accounting systems—requires an early analysis with regard to collection, processing and storage of new RFRs in order to determine the necessary transition effort. However, these are only the easier and more obvious challenges. Various banking methods—like funds transfer pricing—need to be adapted to the new daily rates. Internal risk models and parameters are affected due to insufficient history of spread data. Furthermore, significant implementation efforts and P&L effects also result from so-called fall-back clauses in loan contracts. Many loan contracts include a fall-back solution of continuing the last available IBOR fixing permanently. Contracts based on expiring IBORs maturing past 2021 might be discontinued or changed to the fixed rates which potentially will lead to significant interest losses. Around the transition date, these fall-back options can also lead to open interest rate risk positions and lacking liquidity of hedging instruments. Banks need to quantify these potential effects on interest income and margins early to determine suitable risk mitigation measures. Aside from different fall-back clauses, current contracts with no fall-back solution also exist. These contracts need to be revised or potentially renegotiated which could also have significant implications for profitability, communication, reputation as well as banks’ risk management. Finally, new contracts have to be drafted and product pricing aligned to the new RFRs. All models, processes and products in a bank related to new RFRs need to be adjusted in order to ensure a smooth transition for risk management, treasury, capital markets as well as accounting. Therefore, banks should understand the challenges and opportunities when it comes to reformation or transition of these new benchmark rates. Although many details of the future rates are still rather vague, the IBOR transition is a certainty with a fixed deadline. Timely evaluation and definition of potential change requirements could mitigate risks but also build competitive advantages as necessary adjustments could be very costly and, in particular, time-consuming.